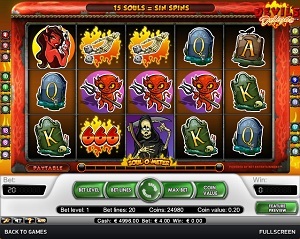 Devil’s Delight is a colorful and comically evil online video slot machine game from Net Entertainment that has been released in October 2008. This video slot machine game has 5 reels and 20 pay lines. The theme of Devil’s Delight, as its name implies, is associated with the reaping of bad people’s souls by the Soul Reaper and bringing them down to the Devil in the depths of hell and make them suffer for their sins. Who doesn’t like Expanding Wilds? In Devil’s Delight, online slots players will surely love playing here as this online video slot machine has red hot Expanding Wilds! Devil’s Delight also has free spins, two different scatter wins, and three unique bonus feature games. Whenever you find an online slot game powered by Net Entertainment, you are guaranteed that you can play that slot game instantly, without you having to download it. If you fancy being the Soul Reaper for a day, then you will surely love reaping souls and winning loads of prizes (such as a max cash jackpot of $20,000 and a max coin jackpot of 40,000) along the way with the Devil’s Delight online video slot game! Comic-looking animation graphics and sounds as well as nice bonus features that pile one after the other, that is what you can expect from many of Net Entertainment’s online slot machine games. Devil’s Delight has a setting in the depths of hell, in a much “lighter” atmosphere. The design of the outside of the reels is flames, which is what you would normally think of when asked what hell is supposed to look like. The symbols are drawn are in a goofy cartoonish manner (think the Grimm Adventures of Billy and Mandy). The overall graphic design of Devil’s Delight displays a wide variety of colors such as blue, green, yellow, brown, purple, orange, and of course, the color red. As for the sound, Devil’s Delight does not have any scary sound effects. The usual background music you will hear is the soft wind with the tapping of a metal or something. When spinning the reels, you will hear a harp-like sound; and when you are going to hit a win, the music becomes faster, making you feel more excited as you anticipate that win in the end. The regular symbols are the card deck symbols, Q, K and Ace; other symbols that were used perfectly complements the theme of the Devil’s Delight slot game which include the red She Devil, the purple imp Gluttony, the red imp Lust, the cauldron Sloth, Pride (heart with devil horns, wings and tail), Wrath (skeletal hand with 2 dice), and the number 666. The Wild Symbol is the Devil. It functions as an Expanding Wild symbol, which has a very useful ability that all online slots players love. Expanding Wild symbols automatically expand in order to cover the whole reel they appear on, if it results in a bet line win. The Devil Expanding Wild symbol only appears on reels 2, 3, and 4. The Expanding Wild symbol substitutes for all symbols (except the Scatter symbols). • The Pentagram Scatter Symbol: If you hit 3 or more Pentagram scatter symbols that appear anywhere on the 5 reels, you will activate the Free Spin Bonus Feature game. • The Soul Reaper Scatter Symbol: If you hit 3 or more Soul Reaper scatter symbols that appear on reels 3, 4 and 5 at one spin, you will activate the Soul Reaper Bonus Feature game. Take note that the Pentagram and Soul Reaper scatter symbols do not give you any winnings, but they enable you to activate and play their respective Bonus Feature game. • The first is the Free Spin Bonus Feature Game. If you hit 3 or more Pentagram Scatter Symbols (that are scattered anywhere on the 5 reels), you will be able to activate the Free Spin Bonus Feature Game. Simply click one of the 3 Pentagram scatter symbols so you can reveal the number of Free Spins you will get, along with the multiplier value. During the Free Spin bonus game, 2 or more Pentagram scatter symbols that you get will give you additional Free Spins and/or a multiplier value. The additional Free Spins you get are added automatically to your current Free Spins. The multiplier value is then added to your current multiplier. During the Free Spin bonus game, the max multiplier is set to 5x. Please take note that the Soul Reaper Bonus Feature game can also be activated even while you are playing the Free Spin Bonus Feature game; however, the Free Spin multiplier values does not multiply your winnings during the Soul Reaper Bonus Feature game. • The second one is the Soul Reaper Bonus Feature Game. It is triggered when the Soul Reaper Scatter Symbols (that are scattered anywhere on the 5 reels) all appear at a single spin. During the Soul Reaper Bonus Feature game, you, as the Reaper, will be taken to another screen wherein you must try to match the sins with the characters and when successful, you get to reap their souls. If you have correctly matched a sin to the soul, the character will experience bad things and its soul will be reaped and added to the Soul-O-Meter. The Sin Spins Bonus Feature game is triggered when the Soul-O-Meter contains a number of 15 souls. When the Soul Reaper Bonus Feature game is over, you are then taken back to the main Devil’s Delight slot game and your Bonus Prize game wins are added to your total win. Please take note that the Souls which are added to the Soul-O-Meter are saved for 48 hours from your last spin. • The third one is the Sin Spins Bonus Feature Game. It is triggered when the Soul-O-Meter contains 15 souls. During this bonus game, you are rewarded 10 Free Spins. The more you bet, the more you win during this bonus game. When the Sin Spin Bonus Feature game is over, you are then returned back to the main Devil’s Delight slot game and your Bonus Prize game wins are then added to your total win. Devil’s Delight has 5 reels where you may bet on 20 pay lines. The minimum bet is 0.01 coins and the maximum bet is 0.50 coins per line. Each and every online slot player will agree that an online video slot is not a very good one if it lacks an Autoplay function. More plus points for Devil’s Delight as it has an Autoplay function! With the Autoplay function, Devil’s Delight can be automatically played as simple or as complex as you want it to be. In its simple settings, you can immediately choose from 10 up to 1000 auto spins which play with the use of your preset bet. If in case you’d want to try it out, just tweak the Advanced Settings wherein you can Stop Autoplay each time you win, if you get Free Spins, if you trigger and win the Bonus Game, if your wins exceed a certain amount you’ve specified, or if your cash decreases or increases by a certain amount you’ve specified. After fine tuning the Advanced Settings of the game, just click on the Start button and the game will spin the reels automatically for you.